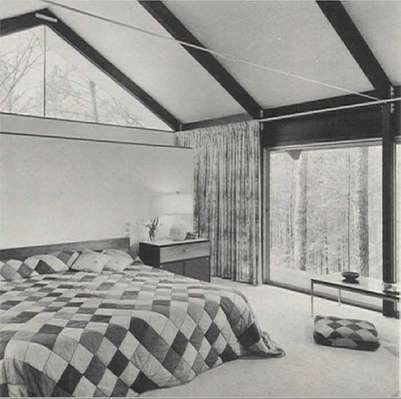 With this inaugural blog post, we are starting a new series of posts highlighting mid-century architects and builders from each state. We are starting at the beginning of the alphabet with Alabama (but we may have to skip around until we find information from some states - Alaska, I'm looking at you.) 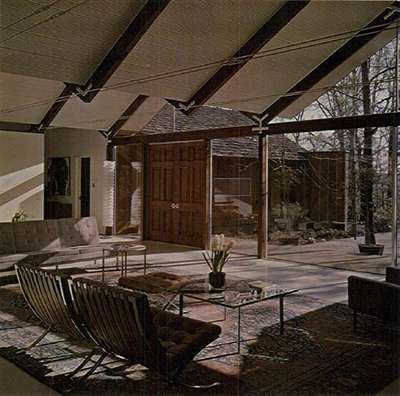 Without further ado; Fritz Woehle, an Alabamian mid-century architect. 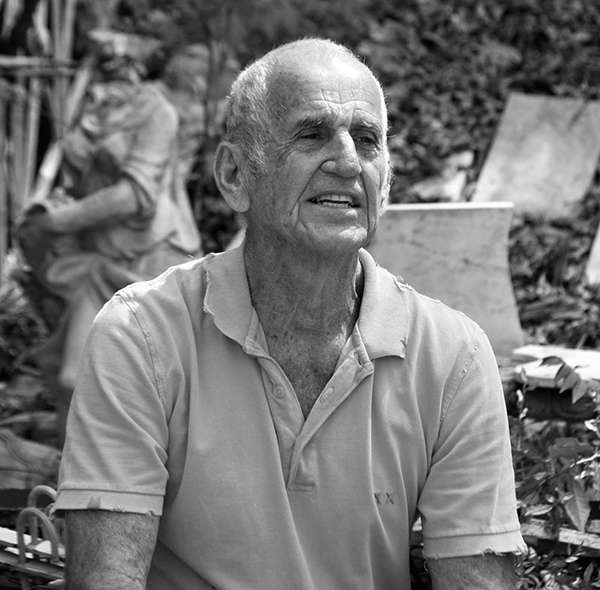 Fritz Woehle was born in Pennsylvania and raised in Florida, but it was Birmingham, Alabama where he eventually made his home after retiring from the marines. His first commission, and the reason for his move to Birmingham, was for the Pilgrim Church UCC in the suburb of Mountain View. 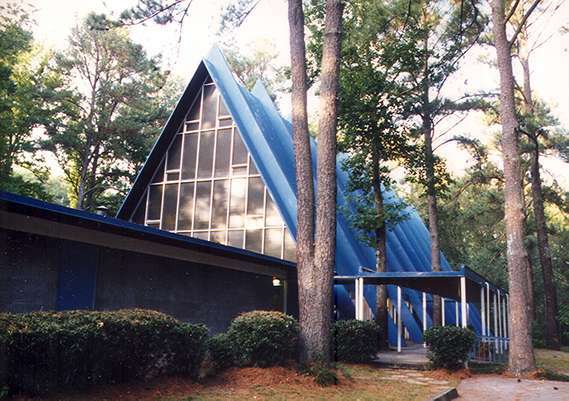 The church was highly recognizable by Woehle's design of a bright blue metal roof and was often referred to by the residents of Birmingham as the "Blue Roof Church". Built for $300,000 in 1959, the church is broken into three A-frame pieces connected with a low spine that runs through the length of the building. Each A-frame roof is highlighted by large standing seams of the blue metal which extend from the peak down to contact points with the ground. Between each structural seam is a large overhang, shading the windows on either side of the church. At the apse end of the church is a smaller scale A-frame highlighted with a red cross that nestles into the frame. 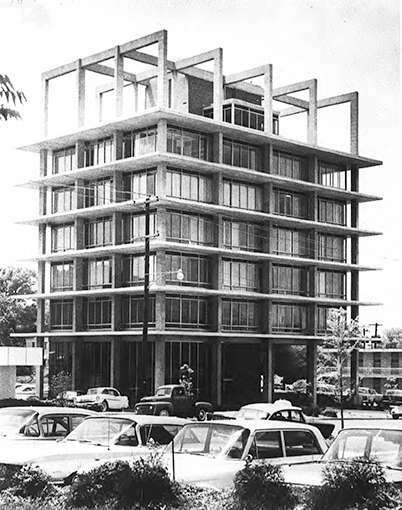 The building was highlighted in a 1960 ad in the Wall Street Journal by the National Steel Corporation for the use of steel as the predominant material in the design. 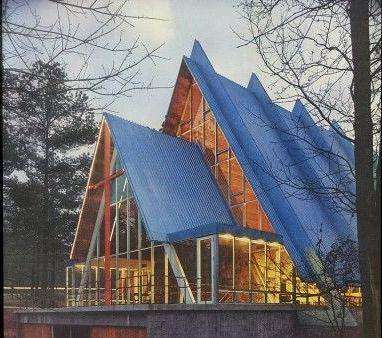 The church also won a 1961 merit award from the Birmingham Festival of Arts for the modern and unique design and use of industrial building materials. Through the late 20th century and into the early 2000's, the church congregation dwindled down to approximately 45 members. Because of the dwindling congregation, maintenance and upkeep of the church were stalled and an estimate for repairs was bid at $2.5 million; much too dear of a price for the church. In 2007, the Blue Roof Church was sold to a developer with designs to redevelop the land into suburban parcels named "Pilgrim Place". The church came down, much of it being recycled, for the subdivision in 2008. 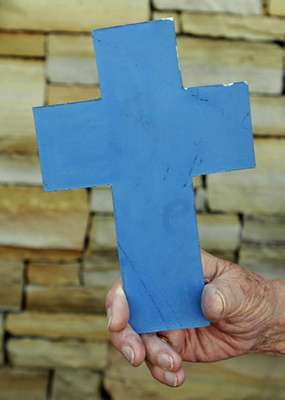 The remaining parishioners did receive one last keepsake of their dear church - blue crosses made from the steel of the church's roof. Woehle's second commission was a commercial project - a seven-story doctor's building constructed in 1960 at a cost of $500,000. The building has a distinctive look - much like a tiered pastry stand - with cantilevered concrete slab floors connected together by a concrete structural handle. 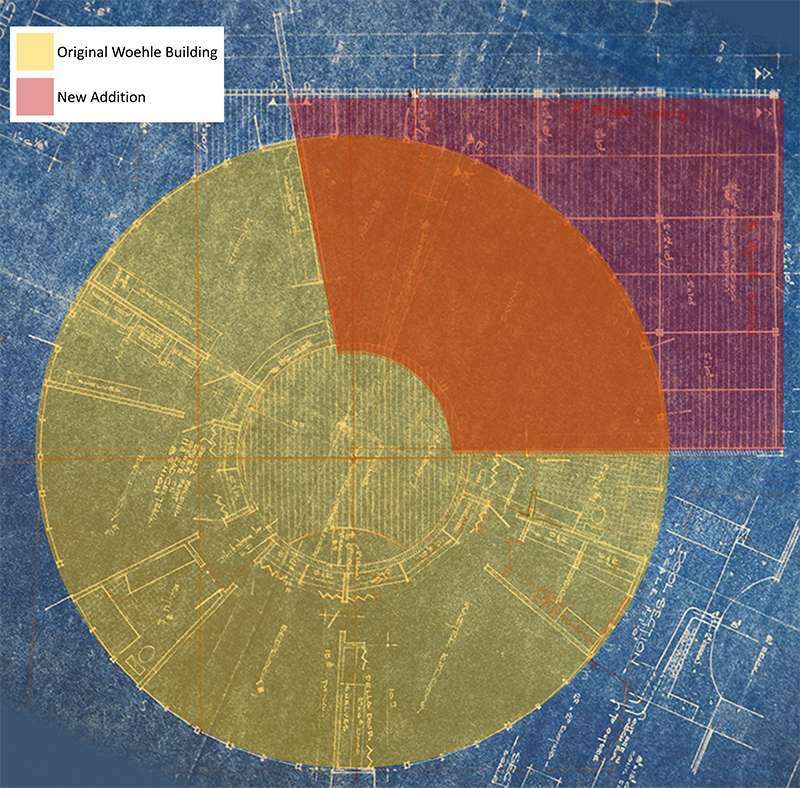 The ground floor housed valet parking while each of the subsequent floors contained four doctor's offices at each corner of the building, although Woehle saved the seventh floor for his own offices. The design was a hit for Woehle, and he planned a sibling of this building, this time with ten-stories, and while bid, it was never built. 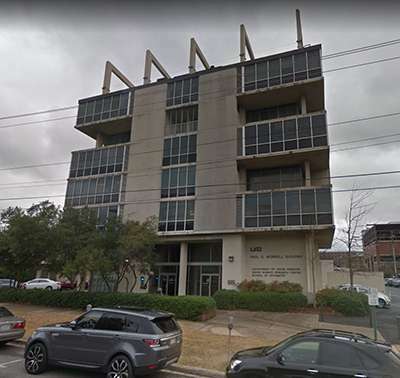 Because of the prime adjacency to the University of Alabama, Birmingham (UAB) campus, the building was purchased by the University in 1985 and utilized for the Vision Sciences Department and the School of Optometry. Don't blink, though, because the building has been slated for demolition as of this year. One of Woehle's next projects was that of his own residence. It was a multiple-year project, expanding to fit the needs of the family until a unified project nestled in a wooded lot was formed. The home's exterior mimics the tall pine trees in the use of vertical redwood siding with reveal lines that enhance the verticality. The central part of the home has almost unlimited glass allowing views out to the surrounding woods on all sides. There is even a central courtyard that literally brings the outside in. 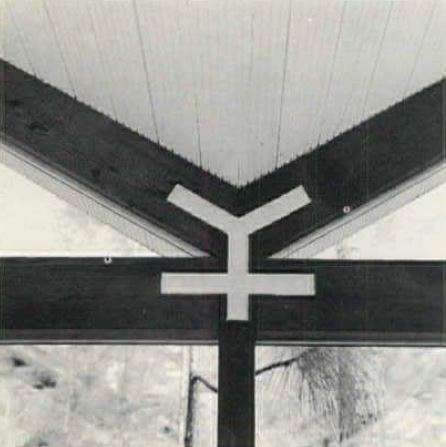 The roof of the home is created from large timber framing with custom steel ties that creates a set of four peaks - two larger over the end quadrants, and two smaller over the central portion of the house. The house centers around a large living room area with four quadrants springing from the center. One quadrant is the kitchen and dining area. 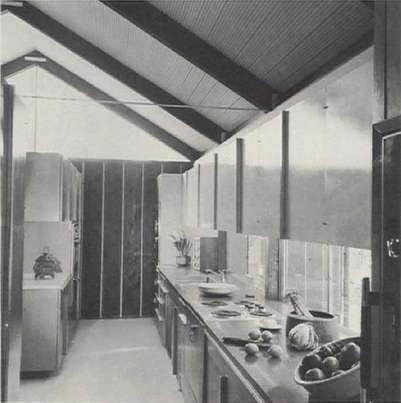 The kitchen, a galley, has cabinets with protruding vertical handles which mimic the exterior redwood siding which has been brought inside on one wall. The dining area is intimate and has a view out to the woods along with a private deck for extending the dining area. The dining deck is removed from the noisier pool area with a wooden wall. In another quadrant sits the master bedroom. Under the larger of the two roof peaks sits a generous volume of space which includes large clerestory glazing along the front wall of the home and two large sets of windows on either side. The quadrants at the back of the house contain the children's bedrooms and guest quarters. A "playroom" (what we would now call a family room) includes views and access out to the large pool and deck. 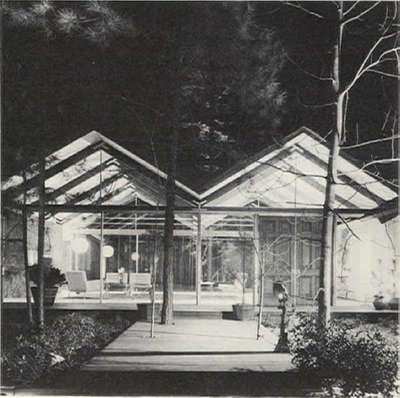 Woehle's design won the accolades and was a featured home in Architectural Record's Record Houses of 1964 in the May issue. 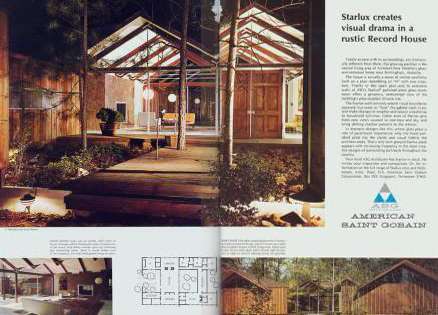 The home was also featured in an ad for Starlux glass by American Saint-Gobain Corporation. 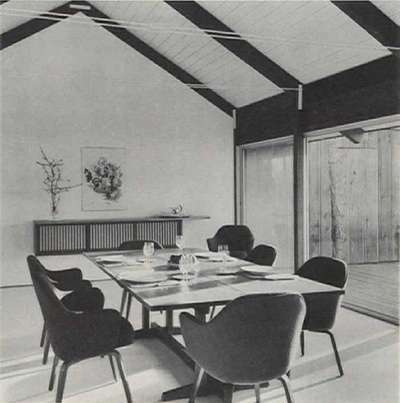 Woehle designed many other residential structures in the 1960's besides his own home. Most are located in the heavily wooded area of Mountain Brook. 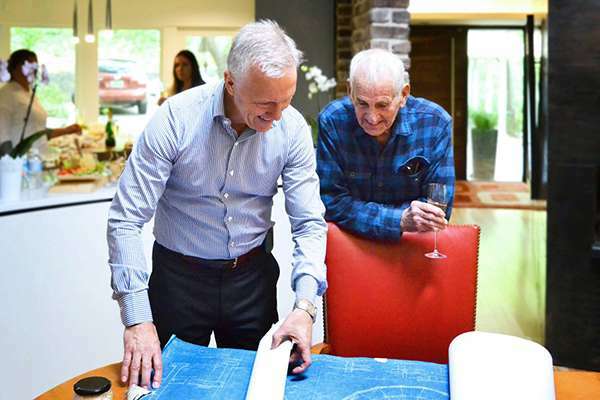 One of those residences was recently remodeled by the Birmingham Architectural firm Design Initiative. Fritz Woehle was even invited to the open house for the reinterpretation of his original design. Admittedly I had questions at first about the addition - until I found the floor plans (below) that shows how the new intersecting glass box addition overlays almost the exact porch/patio area designed by Woehle originally. The addition adds to the usable indoor area while still maintaining the same footprint as the original building. By the looks of the photo, Fritz likes it! Among the other homes Woehle built around the Mountain Brook area are the Higgens Residence and Ireland House. 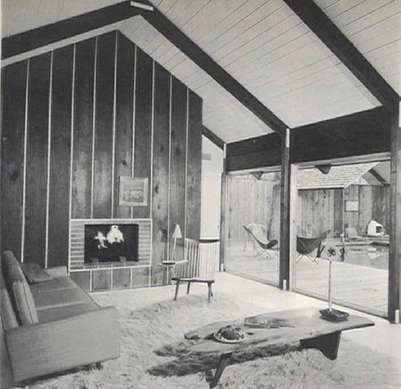 The Ireland House was built in 1965 with a design that was a departure from Woehle's own home of glass and timber beams and the cylindrical offering of the home featured above. The Ireland house design features a repetitive collonade structure formed of masonry which sits in front of a wall of glass. 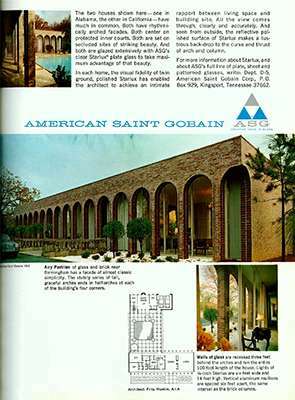 The Ireland House was again featured by an ad for Starlux glass by American Saint-Gobain. 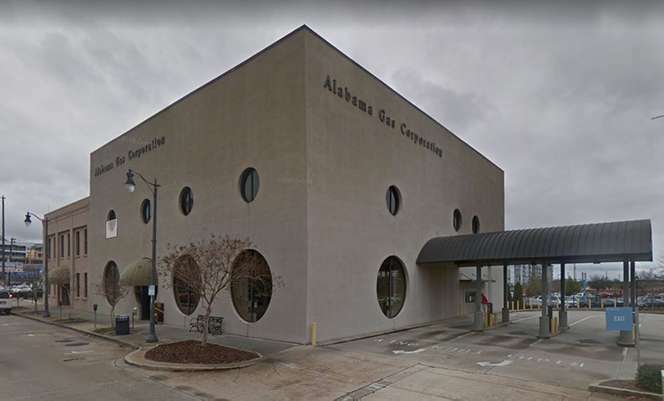 Fritz Woehle himself remodeled a building for the Alabama gas company, Alagasco, on 20th Street South in Birmingham. 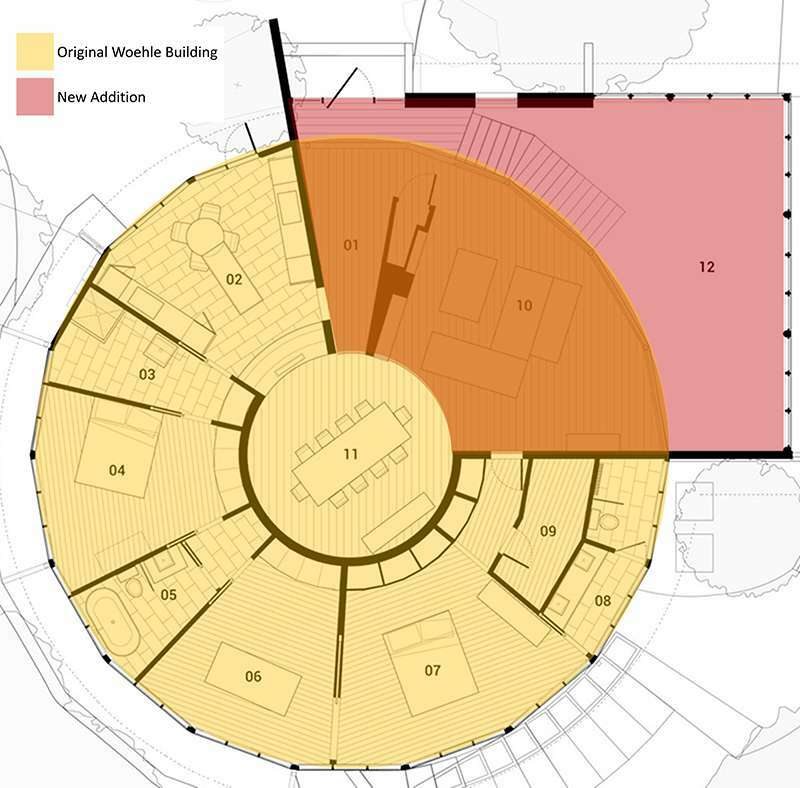 Round windows, large on the first floor, smaller on the second, centered on the lower circular windows, dot the exterior. The redressing is considered "Pop" style architecture and is one of the few examples of this architectural style in Birmingham. All that goes around comes around, and in 2011 the Birmingham Design Review Committee agreed to a proposal for another renovation of this Woehle work - to go back to a classical look (albeit non-permanent classical as the proposed cornices and other detailing were to be made with synthetic stucco, not stone.) Apparently, this project did not come to fruition as this Google Earth image from 2017 still shows the 1960's Woehle remodel. For how long? This is unknown. Fritz Woehle was active in the local Birmingham AIA and served as president in 1967. In 1972 he served as Chairman on the national AIA Design Committee and in 1975 received the honor and status of Fellow of the AIA, the first Alabamian architect to achieve such an honor. Mr. Woehle died in December of 2017 at the age of 88, but his imprint on his hometown of Birmingham is indelible. Thank you for reading about the life and legacy of Alabama architect Fritz Woehle. 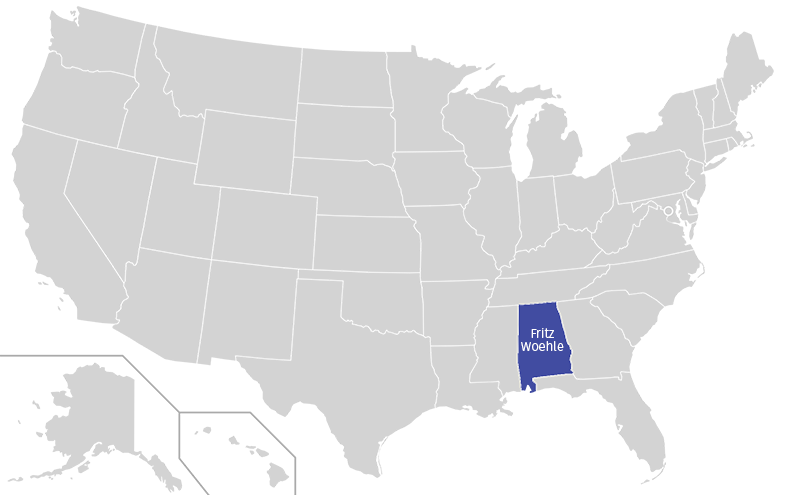 Do you have something to add about Fritz Woehle? Have another Alabama mid-century architect to recommend? Please let us know in the comments below - we always love to hear from you. Heading photograph of Fritz Woehle by Virginia Jones, Birmingham Through My Lens copyright 2010. Used by permission. View of the Pilgrim Church. Attribution: Fair Use. Located on the BHam Wiki and posted by user Dystopos. Image right by user Patriarca12 of the BHam Wiki. Image via The Birmingham News / Beverly Taylor. Attribution: Fair Use. Image of the Doctor's Building in 1962 from 25 Years of Progress in Public Housing (1962) Housing Authority of the Birmingham District, Annual Report - via Birmingham Public Library Digital Collection. Attribution: Fair Use. Located on the BHam Wiki and posted by user Dystopos. 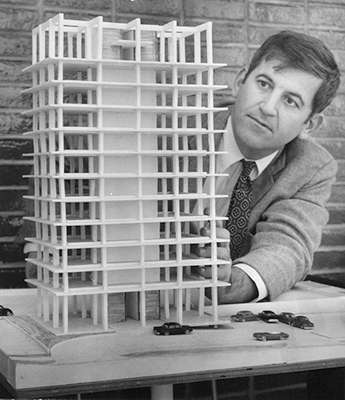 Photo of Fritz Woehle with a model for his ten-story Doctor's Center, from December 21, 1966. Attribution: Fair Use. Located on the BHam Wiki and posted by user Dystopos. Photo via Google Street View; image capture: January 2017, Google. Architectural Record, Mid-May 1964, pages 89-91. Photos by Alexander Georges. Attribution: Fair Use. 1964 ad for Starlux plate glass by the American Saint-Gobain Company (ASG). Attribution: Fair Use. 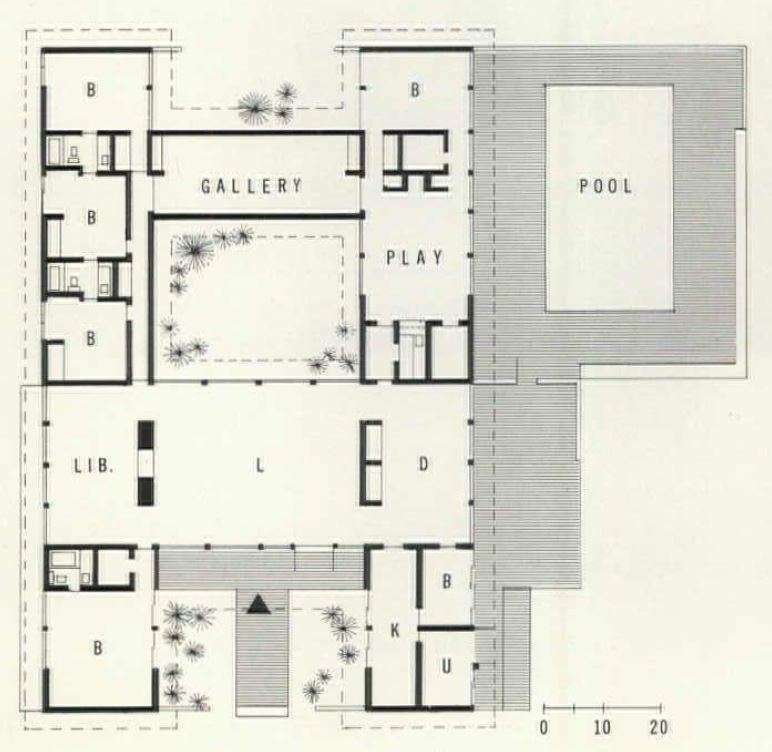 Architectural Record, Mid-May 1964, pages 88. Photo by Alexander Georges. Attribution: Fair Use. All images courtesy of design initiative. Images used with permission. Find more images and information about this project here. 1965 ad for Starlux plate glass by the American Saint-Gobain Company (ASG). Attribution: Fair Use.